A shortage of posts doesn’t mean I’ve been totally idle – I just haven’t finished much recently so have held off taking pics. I have made short work of a recent order to Fantasy Arte in Germany though. They sent me some very nice pieces I can use in my 15mm dungeon game, and being intended for 28mm they’re nicely oversized and look impressive in my setting. 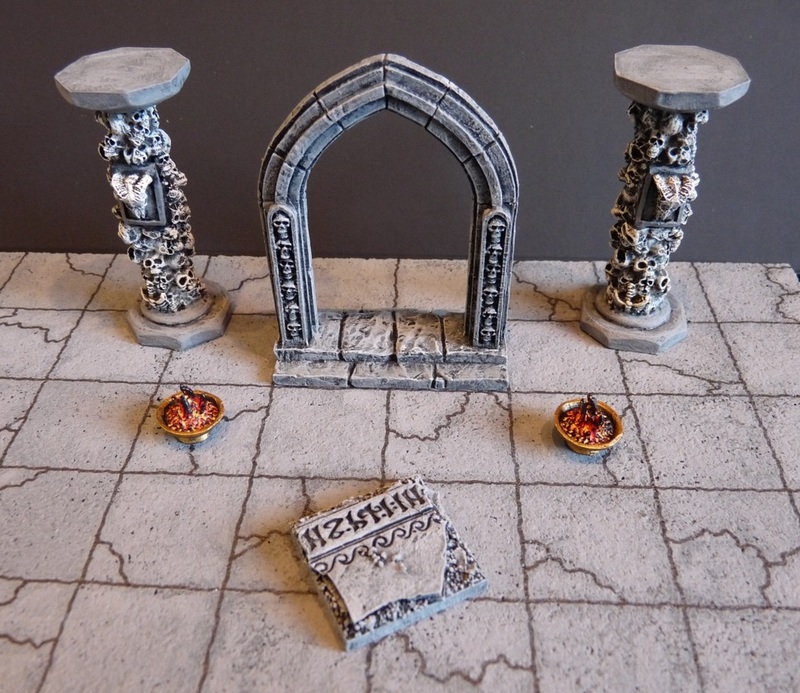 So, a portal arch, a couple of skull-clad pillars, some braziers/fire bowls (I’ve only painted 2 of one type so far, and they’ll be placed on stone plinths soon) and a free sample figure base that fits in perfectly and will be used in the game as a certain type of marker. It’s all very high quality stuff (resin except for the plastic braziers) and a pleasure to paint. I’ve also ordered a few Reaper Bones figures which will serve as (very) big monsters in my game. More on those when I get a couple painted. Also, taking just a few minutes from start to finish, I assembled and painted the Warbases water cart, which is a very nice model and will get used in Sharp Practice and other 28mm games. I’ve got a couple more of their MDF carts to do and will get onto them soon. Apart from these few bits, I’ve painted most of a new force/faction for Dragon Rampant and made more progress on the 6mm SYW Austrians that had been stalled for a while. As soon as the bases are painted I’ll get all of this lot posted here too. I like the Warbases equipment range too. Although my painted wagons don't look as good as that one.